Taoiseach Enda Kenny called him one of the “giants of theatre”. TRIBUTES HAVE POURED in today for Brian Friel, one of Ireland’s best known playwrights, who died aged 86. Friel was best known for his plays ‘Philadelphia, Here I Come!’ and ‘Dancing at Lughnasa’, both of which were performed internationally and adapted into films (the latter starring Meryl Streep). He died this morning after a long illness. Theatre producer Noel Pearson, who worked with Friel on ‘Lughnasa’ said it was a “terrible day”. He was “one of the greatest playwrights we’ve ever had,” Pearson told Today with Sean O’Rourke. Telling a story about Dancing at Lughnasa’s success at the Tony Awards (it won three) Pearson said the playwright hadn’t attended the ceremony as he “didn’t like the fuss”. He was a “unique” individual and a “great guy” he added. Brian himself had joked about the fact that he was coming toward the end of his life when Pearson visited him recently, the producer said. “I suppose you came up to see me on the white sheet did you?” the playwright asked him. Producer Michael Colgan also paid tribute to the playwright, saying that it was a shame to have to use clichés, but that in this case they were all true. “We will never see his like again,” Colgan said, describing him as our “greatest playwright of the 20th Century”. Brian Friel was born in 1929 in Omagh, County Tyrone. His father a schoolmaster from Derry and his mother a postmistress from Glenties, Co Donegal. He was educated at St Columb’s College Derry, the same school that Seamus Heaney and John Hume attended, and St Patrick’s College, Maynooth, where he studied for a career in the priesthood. He eventually decided to follow his father into the teaching profession, attending St Joseph’s teaching college in Belfast and working as a school-teacher in and around Derry from 1950-1960. Friel’s first major stage success was ‘Philadelphia, Here I Come!’ in 1964. Subsequent plays include ‘Lovers’ (1967), ‘The Freedom of the City’ (1973), ‘Volunteers’ (1975), ‘Living Quarters’ (1977) ‘Faith Healer’ (1979), ‘Translations’ (1980), ‘Dancing at Lughnasa’ (1990), ‘Wonderful Tennessee’ (1993), ‘Molly Sweeney’ (1994) and ‘Give Me Your Answer Do!’ (1997). He also wrote adaptations of works by Turgenev and Chekhov. In 1980, he co-founded the hugely influential Field Day Theatre Company with actor Stephen Rea. They staged Friel’s Translations as their first production in Derry’s Guildhall, and went onto stage new productions each year and publish extensively – over 20 titles in the fields of literary criticism, history, Irish art music, cultural studies and art history. The first ‘Lughnasa International Friel Festival’ was held in August of this year. ‘Dancing at Lughnasa’ was chosen as the event’s signature production, as it celebrated its 25th anniversary year. Arts minister Heather Humphries said this morning she had learned of the playwright’s death “with great sadness”. “Brian was one of our truly great playwrights and was a household name not only here at home but on the international stage as well,” she said. “Irish people will be familiar with many of his works such as ‘Translations’ and ’Philadelphia, Here I Come!’. “It is fitting that perhaps his greatest work, Dancing at Lughnasa, is this year showing at the Gaiety Theatre as part of the Dublin Theatre Festival, marking the 25th anniversary of the play’s premiere in Dublin. “His mythical stories from Ballybeg reached all corners of the world from Dublin to London to Broadway and onto the silver screen,” a statement said. The Taoiseach said Friel’s plays would “forever form part of the canon of greatness in dramatic writing” and called him “the consummate Irish storyteller”. “His work spoke to each of us with humour, emotion and authenticity. Like the great WB Yeats, he also served in Seanad Éireann. Read: The President announced Ireland’s favourite poem of the past 100 years, can you guess? Email “'An inspirational artist': Ireland pays tribute following death of Brian Friel”. 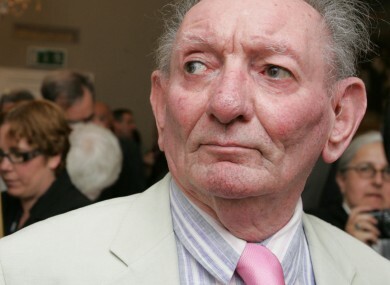 Feedback on “'An inspirational artist': Ireland pays tribute following death of Brian Friel”.